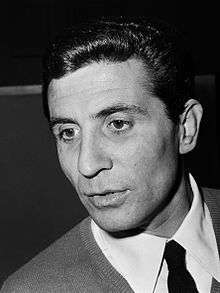 Gilbert Bécaud (French pronunciation: ​[ʒil.bɛːʁ be.ko], 24 October 1927 – 18 December 2001) was a French singer, composer, pianist and actor, known as "Monsieur 100,000 Volts" for his energetic performances. His best-known hits are "Nathalie" and "Et Maintenant", a 1961 release that became an English language hit as "What Now My Love". He remained a popular artist for nearly fifty years, identifiable in his dark blue suits, with a white shirt and "lucky tie"; blue with white polka dots. When asked to explain his gift he said, "A flower doesn't understand botany." His favourite venue was the Paris Olympia under the management of Bruno Coquatrix. He debuted there in 1954 and headlined in 1955, attracting 6,000 on his first night, three times the capacity. On November 13, 1997, Bécaud was present for the re-opening of the venue after its reconstruction. Born François Gilbert Léopold Silly in Toulon, Bécaud learned to play the piano at a young age, and then went to the Conservatoire de Nice. In 1942, he left school to join the French Resistance during World War II. He began songwriting in 1948, after meeting Maurice Vidalin, who inspired him to write his early compositions. He began writing for Marie Bizet; Bizet, Bécaud and Vidalin became a successful trio, and their partnership lasted until 1950. While touring with Jacques Pills as a pianist, Bécaud met Édith Piaf, the wife of Jacques Pills at the time. He began singing at her suggestion in 1953, with "Mes Mains" and "Les Croix". His first performance came the year after. His hits in the later part of the decade included La Corrida (1956), Le Jour où la Pluie Viendra (1957) and C'est Merveilleux L'amour (1958). His first hit in the English-speaking world was Jane Morgan's cover version of "Le Jour où la Pluie Viendra" (as "The Days the Rains Came", with English lyrics by Carl Sigman) in 1958. He began acting in the same period, starting with "Le Pays D'où Je Viens" (1956). In 1960, he won a Grand Prix du Disque and composed L'enfant à L'étoile, a Christmas cantata. That same year, Let It Be Me, an English version of his Je t'appartiens, became a hit for the Everly Brothers, followed, over the years, by Bob Dylan, Nina Simone, Elvis Presley, Willie Nelson, Jerry Butler, Sam & Dave and James Brown. In 1961, Bécaud wrote and recorded "Et Maintenant", one of the biggest selling singles in French history. Translated as "What Now My Love", the song became a hit by Shirley Bassey, Sonny & Cher, Elvis Presley, Judy Garland, Andy Williams, Herb Alpert and Frank Sinatra. In 1962, he completed his largest composition, the 2-act opera L'Opéra d'Aran, which was premiered at the Théâtre des Champs-Élysées on 25 October 1962. The plot of the opera takes place on the Aran Islands, off the west coast of Ireland, although Bécaud up to that point had never been to Ireland. After the opera's performances, Bécaud toured Europe and continued recording a string of pop music hits, including "Crois-moi ça durera" and "Tu le regretteras". He also co-wrote "Love on the Rocks" with Neil Diamond, which was featured on the soundtrack of The Jazz Singer and was an international hit. In addition, he co-wrote "September Morn" with Neil Diamond. Marlene Dietrich recorded his "Marie, Marie" and performed it in her stage shows. His song "Seul sur son étoile" became "It Must Be Him" (with English lyrics by Mack David), a hit in 1967 for the American singer Vikki Carr, and the following year another Bécaud song, "L'important c'est la rose" was given an English lyric (by Norman Newell) and became a hit for the British singer Vince Hill under the title "Importance of Your Love". On 19 June 1968, the American Broadcasting Company aired a half-hour color special starring Bécaud that had been taped in Saarbrücken. Bécaud performed "Nathalie", "Mademoiselle Lise" and "The Day the Rains Came" and sang a duet with Inge Brück, "Sand and Sea". The program also featured performances by João Gilberto, Lill Lindfors and Hans Koller. Bécaud turned his focus more toward touring than recording into the 1970s. An example was his live performance at the festival The Golden Orpheus in June 1971 in Communist Bulgaria. He followed this with some acting work and at last finally took time off in 1973, citing exhaustion. In 1974, he was named Chevalier in the Légion d'honneur. The following year, he scored his one and only entry on the UK Singles Chart with "A Little Love and Understanding" which reached number 10 in the Spring. Later in the century, he began writing with Pierre Grosz and then Neil Diamond, also penning the Broadway musical Roza with Julian More. In 1982, he recorded the duet "L'Amour est mort" with Québécoise singer Martine St. Clair at the start of her career. The 1980s and 1990s saw a slowdown of Bécaud's activity. He released various compilations and toured occasionally. On December 18, 2001, he died from cancer, aged 74, on his houseboat on the Seine and was interred in Père Lachaise Cemetery in Paris. Bécaud's song catalogue, running to around 450 songs, is published by BMG Music Publishing. Bécaud's song "L'Orange" was also the featured track in one of the trailers of the movie Léon (aka The Professional) by Luc Besson. Bécaud has collaborated with Neil Diamond co-writing "Love on the Rocks" and "September Morn". His songs have been adapted and sung by Elvis Presley, Bob Dylan, Nina Simone, George Harrison, Marlene Dietrich, Julio Iglesias, Bing Crosby, Frank Sinatra, James Brown and others. In France, his songs have been interpreted by Édith Piaf, Johnny Hallyday, Dalida, Patricia Kaas just to name a few. 1 2 3 Roberts, David (2006). British Hit Singles & Albums (19th ed.). London: Guinness World Records Limited. p. 50. ISBN 1-904994-10-5. ↑ Axel Klein: "Gilbert Bécaud's L'Opéra d'Aran – A Rapprochement", in: Una Hunt & Mary Pierse (eds. ): France and Ireland. Notes and Narratives (Oxford et al: Peter Lang, 2015), p. 79–90; ISBN 978-3-0343-1914-0.